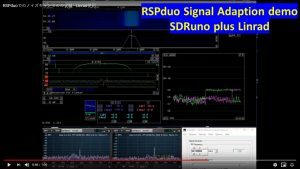 Over on YouTube, ICAS enterprises have posted a video demonstrating “Signal Adaption” using an RSPduo. This is a good example of a feature we think will be enormously powerful, especially when SDRuno is updated to provide accurate time and phase synchronization of the two input signals. From what we understand, this experimental setup used Linrad software with RSPduo hardware to receive a weak Japanese beacon, and then inject an interfering signal, which could be removed. The Linrad software provided the Signal Adaption. Signal Adaption can either combine the wanted signals on both antennas to improve S/N, or it can be used to cancel out an unwanted signal. -injected an artificial QRM using VNWA signal generator -Adaptation is enabled. We hope to write this up more fully as an application note. But meanwhile it is a good indication of the promising potential of the RSPduo.